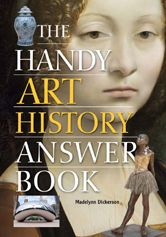 The Handy Art History Answer Book covers everything from Paleolithic images dating back to 35000 B.C.E. to the post-modern techniques of today. It leads you on a tour from the basics and beginnings of art to the various directions that art is heading today. ART OF THE ANCIENT WORLD, 5000 B.C.E.–400 C.E.